From vibrant cultures and traditions to mouth-watering food to tales of ultimate travel experiences, Asia has a lot to offer tourists. Another thing that it's famous for is the treasure trove of goods that you can find in the plethora of markets spread across the continent. Night markets have long been a prominent part of Asian society that bring the travellers close to the local culture as the vibrancy and dynamism they offer is absolutely jaw-dropping. The lively hustle and bustle of the crowd, the chants of the sellers, the narrow paths that offer toys, clothes, souvenirs, accessories and almost anything that one can imagine, is undeniably one of the best experiences. While some operate year-round, others run only on weekends, and a number of them are seasonal. Goa is loved for its beaches and party scenes. However, it is also recommended to escape the sunny beaches to enjoy the various markets that have a lot to offer. The Saturday night market at Arpora, North Goa, known as Ingo's Saturday Night Bazaar, is one of the most famous night markets in India. From spices to jewellery, beach wear to vintage items, this sprawling market has it all. For the foodies, apart from typical Goan food on offer, the market also serves cuisine ranging from Mexican to Italian. Taiwan, a haven for shoppers, hosts numerous night markets in each of its major cities like Tainan, Kaohsiung and others. Although, night markets are traditionally a Chinese phenomenon, the country's scene has grown to be considered one of the best in the world. The Shilin Night Market in Taipei is touted to be one of the largest and most well-known night market in Taiwan, especially with regards to food, and is a favourite focal point for Taipei's night life among residents and visitors alike. Named after the district it's located in, the market has two areas focused on food and non-food items. 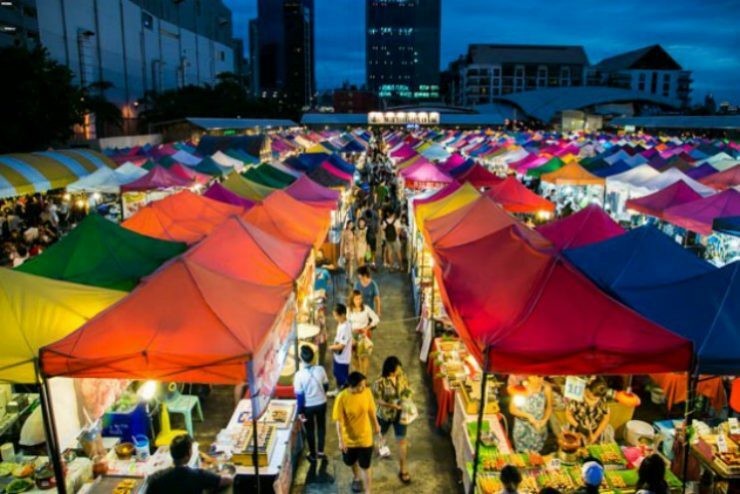 Night markets in Bangkok are among the easiest and most enjoyable ways of getting up close and personal with local life in Thailand's capital- which is famed for its shopping. Well-known by treasure hunters, the Rot Fai Market has rare vintage collectibles that is difficult to locate anywhere else. If pristine antique furniture, timeless fashion pieces are what you are looking for, head straight to this market in Bangkok. A popular street bazaar, the Temple Street Night Market is the largest and the most 'touristy' night market in Hong Kong. Spread out over a kilometre, the market houses everything from cheap fashion and apparel, electronics, cheap art and homeware, and lots of souvenirs. Situated in Kowloon, the Temple Street Night Market is an enduring example of the theatre and festivity of a Chinese market. The Malay word for night market is 'pasar malam', a popular example of which can be found in Kuala Lumpur at Taman Connaught Pasar Malam. It is noted as the longest night market in the country, spanning over two kilometres and is situated in the Connaught Garden area. One surprise after another awaits the visitors along the 700 stalls, mostly run by Thai people selling every imaginable Asian cuisine and merchandise from the entire continent. Ben Thanh Night Market is one of the earliest surviving structures in Saigon and an important symbol of Ho Chi Minh city. It is popular with tourists seeking local handicrafts, textiles, and souvenirs, as well as local cuisine. Formally established by the French colonial powers, this market was destroyed by fire in 1870 and rebuilt to become Saigon's largest market.